When you are ready for a minor version of a file to be viewed by others, publish it. A major version of a file will show as a whole number, such as 1.0. Navigate to the library where your file is located. Click the ellipses (...), click More, and then click Publish. Click the ellipses (...), click the ellipses again (...), click Advanced, and then click Publish a major version. Click the ellipses (...), click the ellipses again (...), and then click Publish a major version. 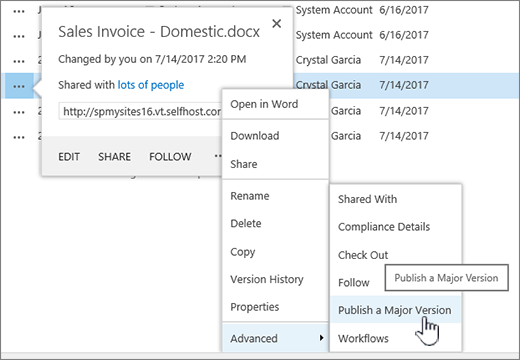 Hover over the title of the document with your mouse, click the drop-down arrow, and click Publish a major version. 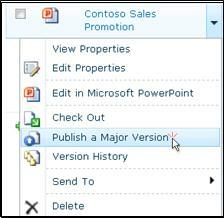 The Publish Major Version dialog box opens. Enter a comment in the Comments field and then click OK. Note: Comments are optional and make it easier to find a previous version. 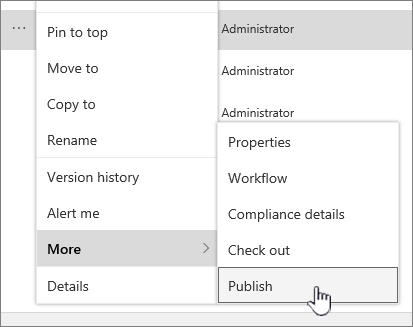 If you have the necessary permissions, you can unpublish a version from a document library. 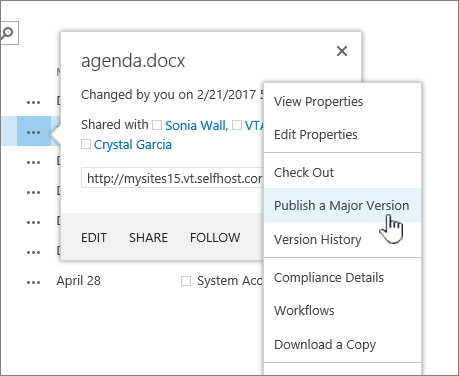 If major and minor versioning is enabled in your library, the unpublished version become a minor version and, depending on the settings in your library, might no longer be viewable by people who have permissions to view only major versions in the library. 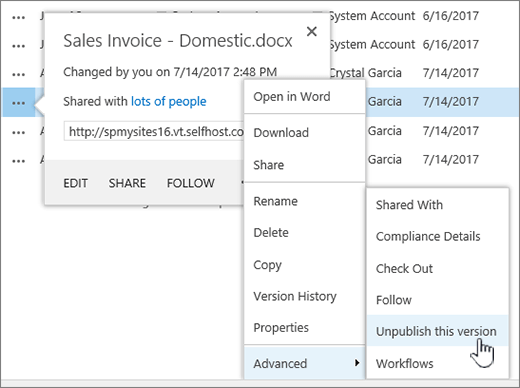 Navigate to the list or library where your item or file is located. Click the ellipses (...), click More, and then click Unpublish. Click the ellipses (...), click the ellipses again (...), click Advanced, and then click Unpublish this version. Click the ellipses (...), click the ellipses again (...), and then click Unpublish this version. 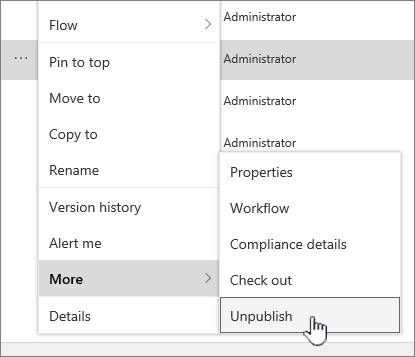 Hover over the title of the document with your mouse, click the drop-down arrow, and click Unpublish this version. 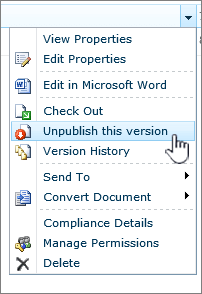 When you are prompted to confirm that you want to unpublish the version, click OK. Note: This article assumes that major and minor versions are enabled for your library. If you have permission to do so, you can manage versioning settings for a library from the Library Settings. 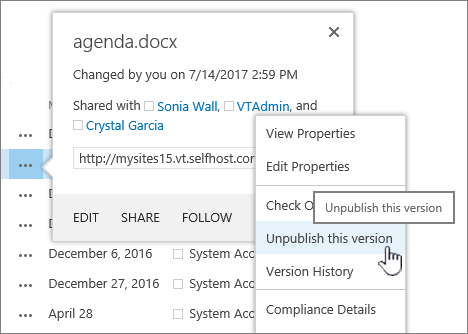 For more info, see Enable and configure versioning for a list or library .